This is a 100 Number square. By clicking the 99/100 button it can be toggled between going from 0-99 or from 1-100. Whatever colour is selected by the buttons with a circle on them will be the colour that the squares will change if tapped. Tapping the button with the four coloured sqaures changes all tiles to that colour. Selecting the lowest left button and then touching individual squares will set them rocking to draw particular attention to numbers or to help any students with colour vision problems identify the squares being looked at. Tapping a sqaure again with this option selected will stop it moving. The button next to it will stop the rocking effect on all tiles that are currently rocking. This updated version now allows you to highlight multiple squares by swiping across them rather than tapping them individually. This greatly speeds up the set up of new examples. 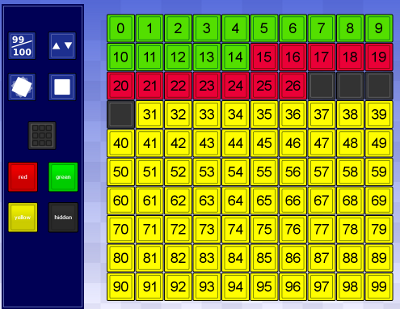 Go to interactive whiteboard number square. This resource is quite large so for best effect use your browser in full screen (In Internet Explorer press F11).